The Single Vineyard Pössnitzberg is predestined as a great white wine terroir. Due to the interaction of the soil structure and of the climatic factors this single vineyard is unique and these Chardonnay wines are very authentic. Our wines from Pössnitzberg, classified as “Große STK Ried” (Grand Cru STK site), are delicately mineral, very salty on the palate and show a tight structure and high ageing potential. The harvest yield is limited to a maximum of 45 hectolitres. 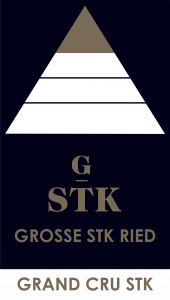 Grand Cru STK wines are allowed to be offered for sale at the earliest on the 1st of May after 18 months of maturation. From the geological point of view the Pössnitzberg is located within the southwestern Styrian sea basin. Approximately 16 million years ago some 1000 meters of mighty marine sediments accumulated. Geologists describe these fine marine sediments as “Styrian Schlier”. It consists of chalky fine-sandy, mostly green-greyish marl clay or argillaceous schist with deposits of sand, fossils of leaves and gloss carbon residues. These scarce and very chalky soils, called “Opok” (chalky marl), are characterised by a humous topsoil formed by weathering, which often does not exceed a height of 20 centimetres, and firm sedimentary rocks.